72K – Cows That Is. The BION Corp is actively pursuing a project in Oswego County NY that would put 72 thousand head of beef cattle into a perpetual motion machine of beef/energy production. They want to put 72000 beef cattle on 5 farms in lots of 67 acres each. The manure would be transported to a plant where the methane gas would be collected and used as fuel. The cellulose from the treated manure would be burned to power an ethanol plant which would create ethanol from corn. The by-products of the ethanol plant would be trucked to the livestock facilities to feed the cattle. Corn shipped in – nothing but energy and meat shipped out. Sounds too good to be true doesn’t it? 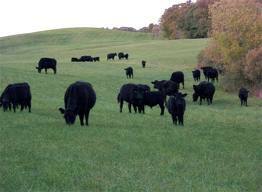 72K head of cattle on 5 sites of 67 acres each is 14,400 animals per site or 215 animals per acre. BION claims the plant will be able to produce several thousand gallons of ethanol per year. 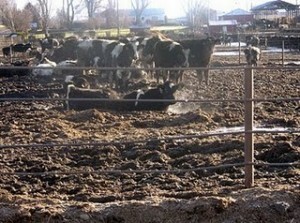 The animals will be producing around 450 TONS of raw manure per year. What kind of holding facilities will be needed at what capacities? How will that be transported? By truck? What is left over after taking out the cellulose? How will that be handled? Who will shoulder the responsibility for the safe handling of that waste stream? And while we’re at it. What is the anticipated mortality rate for these beef cattle? How will the animals who don’t make it to slaughter be disposed of? Who takes the financial hit for animals that succumb to the pressures of high intensity livestock handling? Who will own and run the slaughterhouses? Will these be safe and well paying jobs? Or will these be like the horror stories we hear of in other states where migrants labor long hours for low pay in atrocious conditions with high rates of injury and sometimes death? How will the slaughterhouse waste be handled and whose responsibility will it be? Is this the type of slaughterhouses we need in NYS? BION is pursuing the project. They have the idea and stand to gain from royalties on their intellectual property and patents. It seems BION will not be running or managing the different operations. BION claims this project will bring 600 jobs paying $20.3 million per year. Is that 600 jobs paying $34K a year? (not bad but well below the US median wage) Or will their be a few managers earning $100K each and the rest getting maybe $20K a year for jobs that entail long, hard, dirty work? That’s what we call the working poor. Is anyone asking about the amounts of water these operations will require? What about the waste water? What will it be contaminated with and how will it be treated? BION says that some liquids will be managed by a “reconstructed wetland”. Does that mean they are going to build a swamp? Where? What exactly will be going onto it? Will it smell? Don’t swamps usually smell? Ana thinks what we really need is 1000 farmers raising 72 head per year of primarily grass fed beef, raised on pasture as nature intended, with the manure being returned to fertilize crops and pasture. Instead of one slaughterhouse closed to outside animals, we need several small slaughterhouses that provide facilities for local livestock producers and hunters.